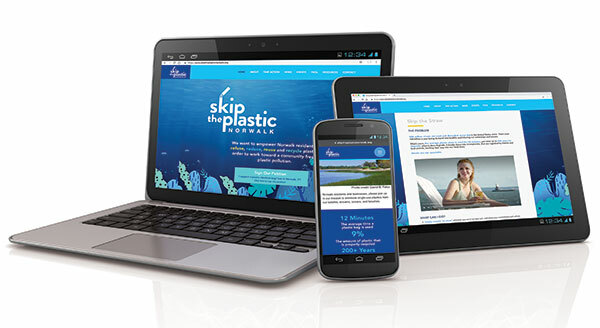 Skip the Plastic Norwalk Website Launched | TFI Envision, Inc.
Norwalk, CT — Skip the Plastic Norwalk asked TFI Envision, Inc. to design their website – https://www.skiptheplasticnorwalk.org. TFI Envision had initially developed the Skip the Plastic Norwalk / Skip the Straw Norwalk logos, which have already garnered a prestigious Silver Award from Graphis Typography and an American Graphic Design Excellence Award. The continuation of the brand essence throughout all of their marketing and support materials is critical in establishing a consistent and credible look for this important initiative. The website was designed to provide easy access to information about this initiative. “Thanks to TFI Envision’s incredible design work, the response to all of the materials, including our new website, has been outstanding. It has truly helped us build recognition and respect with the community. We’ve even had other communities reaching out to us in hopes of using the same design because they felt it was so effective. We respectfully declined.” said Skip the Plastic Norwalk’s founder.